Ari Fleischer Zings MSNBC: Should Dems Denounce Keith Olbermann? 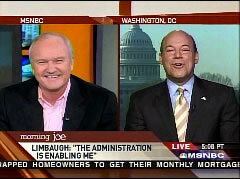 Former Bush White House press secretary Ari Fleischer appeared on the Thursday edition of MSNBC's "Morning Joe" and stopped the program cold when he challenged the hosts as to whether they were "going after Democrat members of Congress for why they aren't distancing themselves from Keith Olbermann?" Co-anchors Joe Scarborough and Mika Brzezinski, who had been discussing the battle between the White House and Rush Limbaugh, were silent for a moment before Brzezinski admitted, "That was a good one. We're all thinking." Fleischer pressed, "That's my point. It's a one-sided debate because, largely, the press loves it because the press doesn't like Rush." The quip occurred after Brzezinski attempted to trap Fleischer into saying that he would be following the tactics of attacking the radio host, were he in the same situation as the Obama White House. After Fleischer's jibe, Scarborough started sipping from his coffee and attempted to toss the potential network hot potato over to the show's other guest, Mike Barnicle. 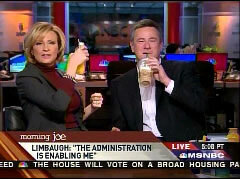 Scarborough joked, "I'm going to have a – I can't talk right now because I'm drinking. Mike?" A few seconds later, however, the token MSNBC conservative did admit, "No, that was good." JOE SCARBOROUGH: All right, let's bring in right now former White House Press Secretary Ari Fleischer. Ari, thank you so much for being with us. SCARBOROUGH: A lot of people don't realize Ari not only was the spokesman for the Bush White House, he also is running PR for Michael Steele, at least over the past two weeks. MIKA BRZEZINSKI: Good. He can explain what's going on there. SCARBOROUGH: You're doing a helluva job, Ari. What's going on there? FLEISCHER: Good morning. It's great to be on your show where you make things up. SCARBOROUGH: Well, we find it easier than reading newspapers. No, let's talk seriously about Michael Steele. What would you instruct the leader of the RNC to do at this point? FLEISCHER: Frankly, I think the RNC, Michael Steele, should not have taken the bait on this whole issue. They fell into a silly political trap. But what I find most distressing though, Joe, is didn't President Obama say he wanted to change the way politics was done in Washington, be post-partisan. He talked at the inaugural address about not engaging in childish things and his Chief of Staff engages in one of the biggest childish things imaginable. This whole food fight over Rush Limbaugh is a distraction from the economy from health care and the things he should be working on. It just makes me think Barack Obama is like every other politician who just seeks political advantage. SCARBOROUGH: Hold on. They found Rush Limbaugh. They said, you should target him. If that's not political gamesmanship, if that's not politics the way Washington's run for the past generation, I don't know what is. FLEISCHER: Joe, listen to this. Here's what Barack Obama said in his inaugural address. We've come to proclaim the end of petty grievances, the recriminations that have strangled our politics. He cited scripture, and then he said, the time has come to set aside childish things and then his staff engages in those very things that his inaugural address talked about. You know, Barack Obama has huge popularity, but I think he is planting the seeds which could hurt him down the road if he really is no different from anybody else. And that's what I think this episode shows. SCARBOROUGH: And, you know, Mike Barnicle, that makes me sad, I'm like the Indian that has the tear coming out the corner of his eye. SCARBOROUGH: I believed he would be different. BRZEZINSKI: It was Ari. It was Ari. MIKE BARNICLE: Ari, you can't seriously believe – do you seriously believe that Obama and his staff, including Rahm Emanuel, what do you figure they're spending, two, three, four minutes a day on Rush Limbaugh? I mean, come on. FLEISCHER: You know, Mike, how it works, you plant the bomb and you see where it goes off. But isn't that what he said he would stop in Washington? 2004 he said there's not a red America, there's not a blue America, there's a United States of America. My point is, what he is doing and what people on the cable shows have all picked up on, is exactly what people get weary of Washington for. And it's what every politician does. He wanted to be different, and I think he's squandering that chance to truly be different, especially to Republicans who question his policies, but really thought he might be a different type of leader. That's the big problem I have with all of this. This is – this reminds me a lot of the lipstick on a pig issue during the campaign raised against Barack Obama. It's foolish, who needs to get into that? BRZEZINSKI: Ari, if you were standing at that podium, would you have not taken the opportunity to do what they are doing with Rush Limbaugh? SCARBOROUGH: Let's say Michael Moore. FLEISCHER: You have to be careful when you stand at that podium, you don't realize until you're in that unique job how much weight your words have. When you previously as a Senator's press secretary or a party secretary, press secretary, could dismiss or take a slap at a political opponent, when you do it from the White House, you're bringing the weight of the government onto that private person. So, you really have to be careful about it and do it with some grace. Going after Rush Limbaugh, it's just -- to me it's the usual nonsense. SCARBOROUGH: They targeted him, Mika. BRZEZINSKI: I'm saying you wouldn't have pointed that out? FLEISCHER: It's gamesmanship, what difference does it make? Are you going after Democrat members of Congress for why they aren't distancing themselves from Keith Olbermann? BRZEZINSKI: That was a good one. We're all thinking. FLEISCHER: That's my point. That's my point. It's a one-sided debate because largely the press loves it because the press doesn't like Rush. SCARBOROUGH: I'm going to have a – I can't talk right now because I'm drinking. Mike? BARNICLE: I have to ask you, Ari, because you were really good when you were standing at the podium. SCARBOROUGH: No, that was good. BARNICLE: But did you have to soak your face in cement this morning to come out and say all of this with a straight face. I mean, come on! FLEISCHER: You are so part of how Washington's always worked and this is why people give up. FLEISCHER: You guys love this story. You love what Barack Obama and Rahm Emanuel are doing because it gives the left an excuse – not you, Joe – to go after people like Rush and conservatives and like they did to Newt. But don't you realize, this is why so many people in America tune out Washington? Especially at a time when we got so many bigger issues. Yeah, Mike, it's two or three minutes a day, that's all it took for them to plant the seeds of destruction they wanted to plant.